The Secret of The Mysterious Handbag In Ancient Times – Hidden Technology? Mankind is a species with amnesia. The veil of time has obscured a lot of ancient knowledge and technology. Luckily some ancient stone carvings, statues and art works offer us the opportunity of understanding some of these forgotten tools. In Mesopotamia, the cradle of modern civilization, the symbol of the mysterious handbag is shown in countless stone carvings and statues, dating back as far as 10.000 bc. The handbag motif is featured prominently in their sacred artwork. 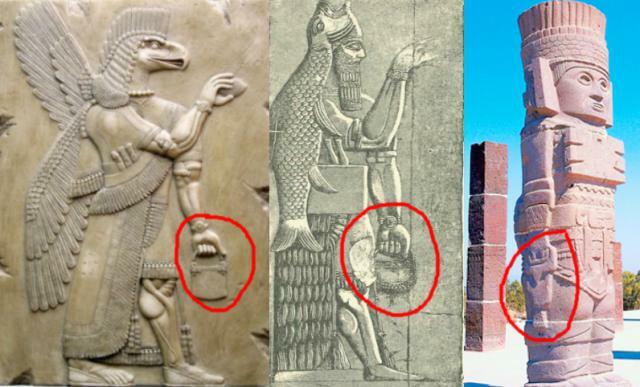 The Sumerians depicted the so called Annunaki carrying what seems to be a handbag. These Annunaki were called the Nephilim in the Bible. The object is linked to the archetype of “The Tree of life” which connects to heaven and the underworld. It was said it connected all forms of creation. In ancient Egypt, we can see the Ankh symbol being carried in a very similar way. The Ankh was the symbol of life. Could it be that the Ankh symbol and the symbol of the handbag are one and the same? In Mexico, the handbag symbol can be found on many historical sites and is depicted in their most sacred works of art. In Indonesia, we find the same handbag featured in multiple stone carvings. How did this handbag symbol become a world wide phenomenon? And more importantly, what did it represent? Did it contain secret knowledge offered by the gods as some myths claim? Was it some form of secret technology that we have forgotten?